During the summer months, I spend every weekend an hour south of L.A. in my hometown of Laguna Beach. I enjoy being close to the ocean on longer summer days, and it’s such a nice time of year to be near my family (not to mention how much my pups Chloe and Fitz love a good beach run every morning). Since I do spend a lot of time in Orange County, I often get friends, family and even LaurenConrad.com readers asking me for my top recommendations for where to eat, what to do, and where to stay in this beachside town. 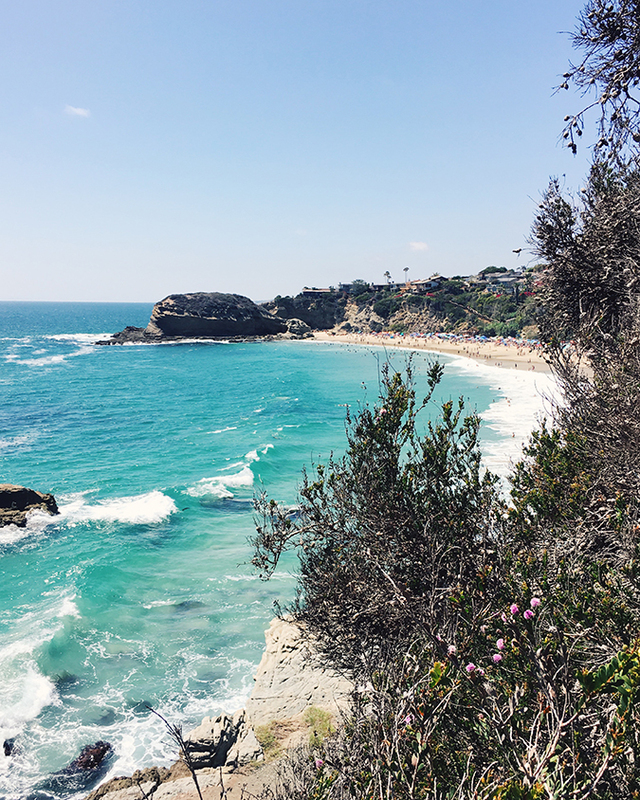 And while we have done an L.A. city guide here on the blog (and several other cities, here), it recently hit me that I have never shared my Laguna Beach recommendations. So, I sat down and made a list of my favorite spots for all of you who may be making a trip here this summer. I must say, it was a pretty fun process because it inspired me to do a mini staycation in my very own city! This Mexican food restaurant near Crystal Cove boasts the most delicious spicy margaritas, awesome guacamole, and a bustling bar scene after the sun goes down. I crave Javier’s at least one a week during the summer months! In the heart of Laguna Beach, just a block off the main drag is American fare restaurant, Nick’s. Their craft cocktails and buttermilk fried chicken are definitely something to write home about. Just make sure to make a reservation a couple weeks ahead of time—this spot is always in high demand. I love having girls’ dinners at Driftwood Kitchen on the weekends because the windows of the restaurant look right out onto the beach. You can literally feel the sea breeze. Arrive early and grab a drink at The Deck before you eat—more on that below! Looking for the best sushi restaurant in all of Laguna? San Shi Go is one of my favorite restaurants for fresh fish and a beautiful view of the ocean. The service is unbeatable, and this spot is perfect for both a casual lunch or romantic dinner date. Rooftop Lounge is the place to be on a summer evening in Laguna. Climb the stairs up to the roof and try not to gasp when you see those 360-degree panoramic views of all of Laguna Beach. The appetizers aren’t bad either—just arrive early if you want a seat. Otherwise, it’s standing room only. As I mentioned above, The Deck is the perfect beachside bar for sunset cocktails and live music. It’s such a perfect spot, you may never want to leave. A tad more casual than Rooftop and The Deck, The Cliff is one of those happy hour spots you might even stumble upon without realizing. Hidden within a maze of outdoor shops right off PCH, The Cliff is the perfect destination if you’re looking for cocktails and live music on those evenings when you haven’t even changed out of your bathing suit yet. Skyloft in downtown Laguna is the new kid on the block when it comes to happy hour spots, but it’s definitely one worth visiting. Take the stairs to the rooftop and secure a table by the ledge for a view of Laguna’s Main Beach. Oh, and the Mai Tais here are deadly. This hotel is nestled on the beach on PCH, which means the ocean is right in its backyard. And not only are the rooms clean, airy and white, but the hotel restaurant Splashes isn’t one to miss. The Spanish-colonial style décor of this charming boutique hotel is reason enough to book a room. Pair that with its prime location one block from the beach and it’s private swimming pool and… Do I really need to say more? This beachfront hotel is situated at the top of the cliff above Main Beach. With ocean views and restaurants and shops just a few blocks away, The Inn is convenient and comfortable all at the same time. Whenever I travel to a new city, I always look up cool Air Bnbs to stay in because I love feeling like I’m staying in a house or apartment when I travel. Laguna has some pretty amazing options when it comes to beach bungalow Air Bnbs, so click the website above and be sure to browse before booking your hotel! These three drop-dead gorgeous beaches are all just a block from each other, but each one has a different draw for surfers and beach-goers alike. If you’re looking to catch a wave, this trifecta of rocky bottom beaches has your name all over it. Not only is this spot great for that ideal sunset beach snap, the fish and aquatic life swimming in the tide pools also make for a unique experience and hours of entertainment. The beach at the Montage is everything you might dream of when you picture Laguna Beach. The blue-green water and the striking rock jutting up from the sea are unsurpassed. The name says it all… This hike will give you impeccable views over all of Laguna. Just be sure to bring water—there isn’t much shade on this hike and it can get hot! El Morro is a Laguna local favorite when it comes to scenic hikes. You can walk the trail by foot or rent a mountain bike and hit the pedals (if you’re feeling super outdoorsy). No matter how you get there, the views at the top are breathtaking. Note to dog owners: They don’t allow dogs on this hike, so leave the pups at home. Okay, fun fact for you all: My very first summer job was working as an usher at Pageant of the Master’s! The Pageant of the Master’s is an annual arts festival in Laguna that is most famous for its “living pictures” performance, where people are dressed in costume and makeup to literally imitate art. That’s all I will tell you because you’ll have to see it to believe it. Sawdust Festival is another arts festival you won’t want to miss if you’ll be in Laguna anytime during June through August. You can walk around the (literally) sawdust-covered grounds to admire and/or purchase art and handcrafted gifts. This clothing and jewelry boutique is tucked away on Beach Street right in the heart of downtown Laguna. Take a step in their doors and I can’t guarantee you’ll walk away empty handed—between the Isabel Marant pieces, Current Eliot denim and vintage French lace dresses, you’ll want to bring your credit card with you to this little treasure. Every one of the places and activities on this list is a must if you’ll be traveling to Laguna any time soon! If you live in the area, do you have any recommendations to add to my list? What city guide would you like to see us do next?